With the MC9500 you get a robust mobile computer for industrial applications, as well as high demands in transport and logistics. With a modular 3.5 G WAN, new battery charging concept, innovative device management system and the universal accessory system, the MC9500 sets new standards in mobile computing. Equipped with the Marvell XScale PXA320 processor (806 MHz), 128MB RAM/512MB Flash (optional memory expansion up to max. 16GB via an SD slot) and Windows Mobile 6.1, the device delivers state-of-the-art technology. The wide range of communication options (Wi-Fi, WAN, GPS and PAN) guarantees high quality and the best reception, even in difficult conditions. The MC9500 is thus the first mobile terminal with modular 3.5 G WAN that supports a wireless broadband connection via GSM HSDPA or CDMA-EVDO Rev A. For efficient and fast data collection, along with the powerful 9.4 cm (3.7”) touch screen and the modular keyboard options, users also have at their disposal a professional 1D laser scanner, a 2D Imager as well as a 3 megapixel autofocus digital colour camera. 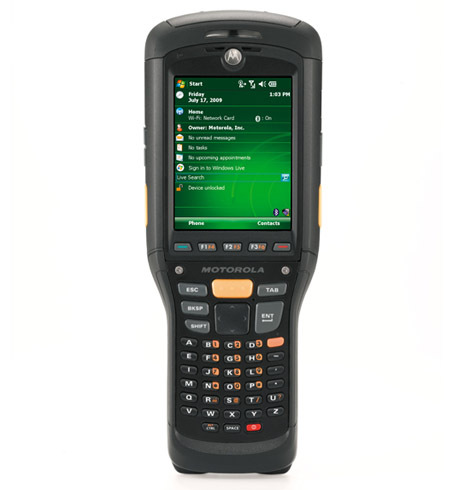 The MC9500 thereby processes manual entries and barcodes, as well as images, documents, signatures in mobile high quality. A particular highlight of the MC9500 is not only the innovative device management system for perfect resource planning, but also the interactive sensor technology (IST) – a new functionality from Zebra that supports a range of motion sensitive applications. In this way, companies can for example determine and record how often a device falls. Moreover, the IST improves energy management and ensures that the mobile computer automatically goes into standby mode when not in use, or when the display is facing downwards. The MC9500’s integrated acceleration sensor allows automatic adaption of the display from portrait to landscape mode and vice-versa. This provides multiple advantages when in use, for example for processing signatures.